A false eye is something which possibly looks like an eye, but really isn't one. 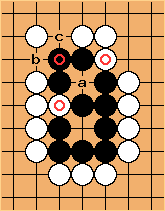 The black group has a real eye and a false eye. The false eye is the one at a. 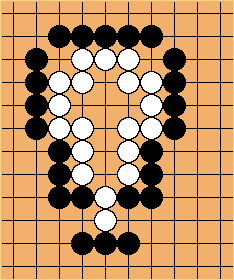 Notice that the marked black stones have an incomplete connection with the rest of the group: a suffers from both marked white stones. 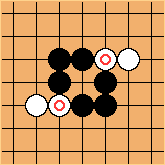 Also, if White fills up the exterior liberties at b and c, the three black stones are in atari. 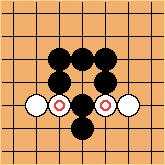 If Black connects them at a, the "eye" obviously disappears. Just the same if Black allows their capture. Thus, a false eye is not an eye. False eyes are fundamentally bad shape, and they can be taken advantage of in order to reduce eyespace or cause shortages of liberties. 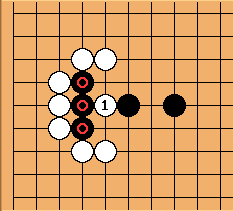 This White group may seem alive at first glance, because it seems to have more eyespace than a straight four group, but it actually has less and is unsettled ! 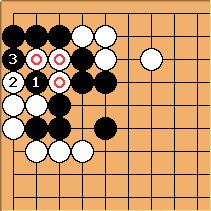 Also, forcing the opponent to create false eyes is a very common technique to reduce the number of liberties of a group. 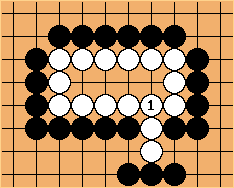 Squeeze tesujis and capturing problems very often involve false-eyes. 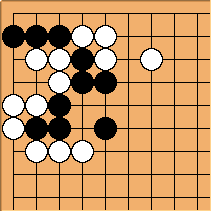 After , the marked stones are captured. Seki some cases of seki involve false eyes.